Skip-to-my-lou, jump up and down, and get ready… the time has finally arrived! 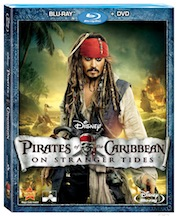 Pirates Of The Caribbean: On Stranger Tides will be released on Blu-ray and DVD this October 18th! In this chapter of the POTC movies, Captain Jack Sparrow (Johnny Depp) searches for the Fountain of Youth. Along the way he discovers someone has stolen his identity. Of course he finds out who the culprit is while he’s looking for a ship and crew of his own. There are certainly different dynamics to this movie, which include the addition of mermaids and zombies. I wasn’t sure how these characters would play into this Pirates of the Caribbean story, and I wasn’t drawn to watch it just based on the movie’s trailer. However, they do play well in the creative way the story is written. You’ll get to revisit an old character favorite, Jack’s nemesis (Geoffrey Rush), and some new star characters including; Jack’s old flame (Penelope Cruz) and Blackbeard (Ian McShane). Pirates of the Caribbean once again brings epic high-quality fun! I’ll honestly be happy to include this latest film in my Pirates of the Caribbean movie collection. I’ll tell you though, if you are going to buy the latest edition and want lots of features, the basic Blu-Ray/DVD 2-disc combo pack does not give you many extra goodies, so check out the 5 disc or 15 disc versions for the treats. Authentic replica Pirate’s Chest, a collectible map and an iconic skull disc case. Soon I’ll be doing another news post about some of the fun online goodies you can check out. Comments for Pirates Of The Caribbean : On Stranger Tides on Blu-ray & DVD 10/18 are now closed.